Alhamdulillah I have come to the end of my tajweed lessons and today was the last lesson before our test next week. 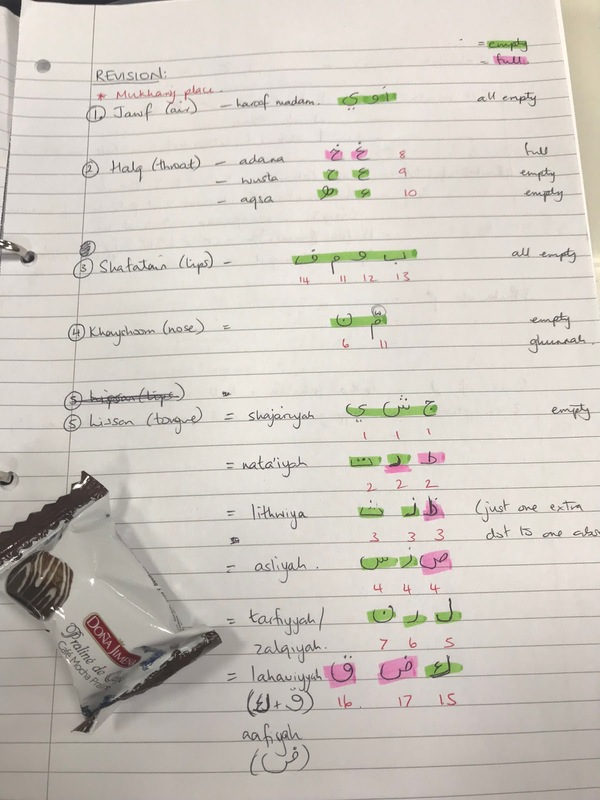 The lesson was spent practising in groups and revising as a class, as well as some time reciting the Quran with our ustadhah (teacher) to check for mistakes and improve our pronunciation. I am going to spend the next few days practising and will ask Little Lady for some of her index cards to make revision cards. Most weeks someone will bring a small treat to share, this week it was chocolates from Spain. It has been lovely seeing the sisters in the class every week and gently, tentatively getting to know some of them. Insh’Allah we are waiting to hear if the masjid will hold level 2 classes for tajweed or tafseer classes (learning the meaning of the Quran), but certainly I have gained a thirst for it, so I hope so.